How about submitting him for a sewing badge, and he could sew on his own subsequent badges? aw cub badges, im hoping to start back as rainbow/brownie assistant soon so will be giving out the badges perhaps. i love all the badges he's got, it's such an achievement for him. if only they were self sticking or else teach the boy to sew, hahaha. 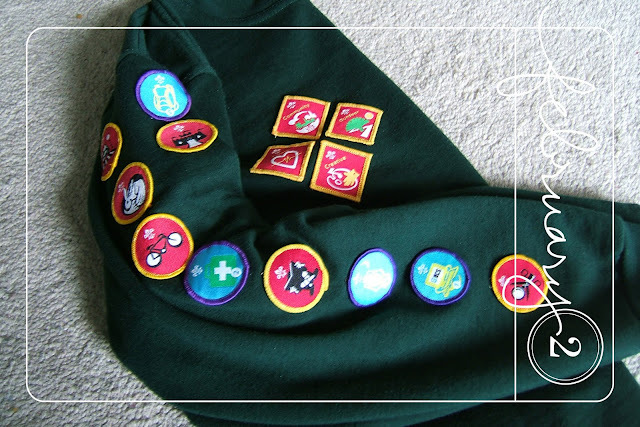 Brings back memories of sewing on Brownie badges! Well done to The Boy - looks like he's got quite a few on his unifrom already. That's an admirable armful of badges he's got! I'm not sorry that my badge sewing days are over....like the idea of him learning to do it himself.....or maybe explain he doesn't have to get absolutely every badge. Good job to The Boy for all his badges (and to his mom for sewing them on)! Awesome picture! You are a good mom. This is one of those pix which you can look back on in the future and think about what he did for each badge. Love it! Lovely lot of badges your boy has collected! Well done to him! I used to have to sew on my own Brownie and Guide badges... he's lucky to have a kind mom to do it for him! Tell him he should do the next one and you'll recommend him for his sewing or handicrafts badge! oh that reminds me I have 2 badges to sew on! Yikes I always forget! !